In the Kimberley region of Western Australia, there are two distinct seasons: a wet season between December and March and a dry season between May and October. Reversals in the direction of prevailing winds are the driving force behind the seasonal shift. Credit: NASA images by Jeff Schmaltz, LANCE/EOSDIS MODIS Rapid Response. Caption by Adam Voiland. In the Kimberley region of Western Australia, there are two distinct seasons: a wet season between December and March and a dry season between May and October. Reversals in the direction of prevailing winds are the driving force behind the seasonal shift. If there are going to be bush fires in the area's tropical savannas, the best time is early in the dry season, when vegetation has dried enough to burn but is still wet enough that fires won't grow out of control. In April and May, fires usually burn themselves out within a few days. The worst time for fire is late in the dry season, when vegetation has dried to tinder and blazes tend to be uncontrollable, intense, and dangerous. 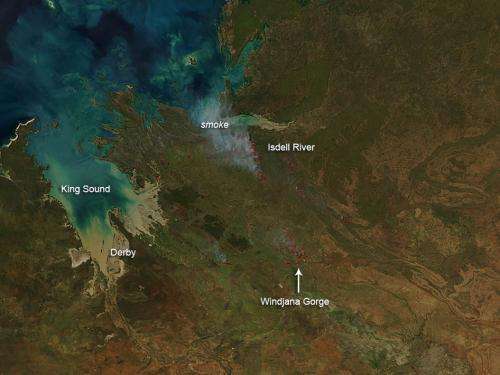 The Moderate Resolution Imaging Spectroradiometer (MODIS) on NASA's Aqua satellite acquired this image of dozens of managed fires in Kimberley on April 10, 2013. All of the fires were south and west of the Isdell River; some were burning in and near Windjana Gorge National Park, a popular tourist destination. Although smoke plumes are visible, that's not how MODIS detected the fires. Rather, the instrument sensed thermal infrared energy radiating from the land surface. The heat is invisible in images like this, but the locations where MODIS detected fire are labeled with red outlines. These prescribed burns are part of a program managed by the Australian government and by conservation groups. The Ecofire effort, ongoing since 2007, has the goal of reducing destructive late-season fires by increasing the number of early-season fires. The early fires tend to burn in a patchwork pattern that makes it easier for vegetation to reestablish itself afterwards. Late-season fires, in contrast, often sweep across the landscape and leave expansive burn scars that alter ecosystems for years. The intent of Ecofire is to return the landscape to a burning regime that mirrors what happened in the past. For tens of thousands of years, aboriginal people in the region engaged in a practice known as "fire-stick farming." People intentionally lit fires in the early-season to encourage the growth of grasslands and to make it easier to locate and track animals for hunting. As traditional lifestyles have been replaced by modern ways of living, the number of early season fires has decreased and the number of destructive, later fires has increased.